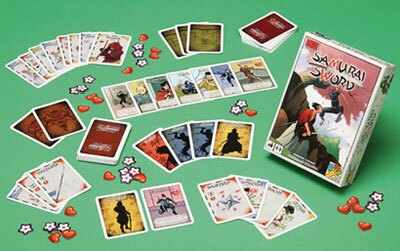 Today, we are going to talk about a little card game called Samurai Sword. This game is based on the wonderful hidden identity card game BANG!, but does not have the dreaded “player elimination” some people dislike in that western gun-fest. Samurai Sword is made my an Italian game company, and has a different feel from other Euro games that avoid interaction… especially direct conflict. In Samurai Sword, you are beating the living tofu out of each other.. and I love it! The setup: You start off by getting a secret identity (shogun, samurai, ninja or ronin). What group you are in is determined by the number of players, but there is always one shogun and a couple ninjas. Now, the shogun is the only one who has to show his/her card, and they are a target for the ninjas. The ninjas, in a game of 4 or more, try to keep their identity hidden… but this is feudal, as they must start attacking the shogun quickly. The samurai are supposed to protect the shogun, and quickly deduce who the ninjas are. Meanwhile, the ronin’s secret agenda is too kill them ALL! Each player also gets a character card with a name, flavor text, and special power. Player variability adds greatly to the replay value of the game. Finally, you start off with a hand of cards determined by the position you are to the shogun, a number of honor points, and life points based on your character. Gameplay: On your turn you take two cards and start swinging. How many times you can attack are determined by character and action cards you are able to set down in front of you. You can always play as many action cards as you are able. Attacks are easily described on the cards with a number for distance and damage. There are cards that increase the distance between you and attackers… and cards that steal those cards… and so on. The game is on!!!! The beauty of this game is the life point/honor point system. When you get attacked, and you can’t parry, you lose a heart (life point). When you lose all you life points, you don’t die, but instead give one of your honor points (lotus) to the player who “killed” you. On your next turn, you get all you life points back to fight again! The game ends when any of the players have lost all their honor points, and the winner is the player/players with the highest total score at that moment. There is a mechanism to remove an honor point from every player each time the deck runs out. This eliminates the other problem BANG! has… going on too long… like this review. Samurai Sword is a great game to play with a varied group of players. I even taught my parents to play it in a few minutes. It’s cheap, can play up to seven, and, with the new rules, takes about a half hour to play. This is a great filler game for 4 or more. My only problem with the game is it isn’t quite as fun with three as I would like… it’s just 2 against 1 with no secrets between you. Should you get this game? Um, duuuuhhhh! This is really a no-brainier for even strategy gamers. You’ve got to have a good game to play when non-gamers are around, and a game heavy on tactics is your best bet at not spending the evening playing Taboo(no offense to Taboo fans, as I fancy a game every now and then). So, yes, do yourself a favor and buy Samurai Sword, and join the Spaghetti Fu revolution! Really fun game and plays thru pretty quick. Easy to pick up though you may stumble with a few details at first. I didn’t play any of the Bang series so this was a first for me. It’s a really interesting mechanic not knowing where the teams are drawn. It’s less cut throat because you know what you’re trying to do but still have to take some care with it. Overall, a really fun, fast, easy game to play thru. It’s unique enough in concept as everyone loves Ninjas so your harder gamers will still enjoy! Certainly a must keep in rotation! After playing Heroes United, Deck Building Game, this game didn’t seem too hard to pick up. There was five of us, took about 45 minutes, w/ explaining for a couple new ones among us. Good dynamics, of the 5 of us, there was a loner, the Ronin, a team of Shogun and Samurai, and 2 Ninjas. The catch is only the identity of the Shogun is known to all. More strategy compared to Heroes United, since you decide how many of your cards to play, if any, and sometimes who to use a card against. There’s also the element of figuring out who your teammate is if you aren’t the Ronin. Otherwise you have the usual elements of attacks, defenses, special powers, ability to draw, discard, or trash yours or others cards. Liked it, would play again. Add a Review for "Samurai Sword"